Crostwick is a tiny village: just a pub, a big house and a few cottages on the busy Norwich to North Walsham road. And this has always been a small, poor parish, its soil sandy and of little use for agriculture. 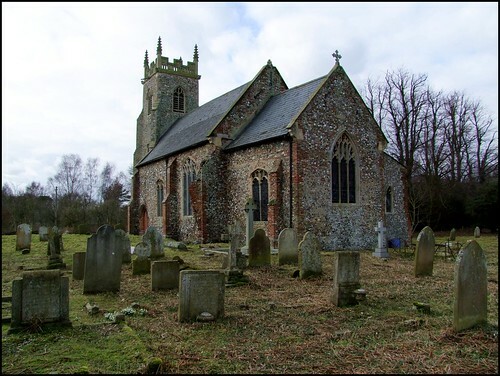 Even in the middle of the 19th Century, when the population of rural Norfolk reached its post-medieval peak, there were barely 150 people here, and there must be many fewer today. I picked up the key from a cottage near the pub, and cycled on up the main road towards where I knew the church to be. I had been through Crostwick so many times, but it had never occured to me before that there might be a church here. It isn't signposted from the main road, and I relied on the Ordnance Survey map to direct me along a muddy track which went into the woods. Even here, I almost came unstuck: the track splits, and I ended up heading into the local Scout HQ. I should have taken the left fork, because after a few hundred metres this leads through the trees to a hidden gem, St Peter, with the rolling fields stretched out beyond. This is a small church, not surprisingly; but its most striking feature is the magnificence of the top of the tower. The tracery is pierced rather than picked out in flushwork, as if this was some great city church rather than a shy local one hidden away in the woods. The rest of the building is perhaps more reassuringly familiar, a slightly ramshackle, rough and ready structure with plenty of red brick among the flint. The result is pleasing; a rather striking feature is the open roodloft stairway on the south side, like looking into the bones of a large animal. Further west, the red brick south doorway has itself been bricked up. I wandered around the tower and back to the north side. I had already been told what to expect. A few weeks previously, someone had driven up with a van, taken up the tiles in the north porch, and driven away with them. I am afraid that the sheer arrogance and selfishness of people who could do such a thing is completely beyond my understanding. I haven't come across many incidents of deliberate damage during my visits to 1,500-odd East Anglian churches, but the stealing of building materials from a church to sell them for a profit seems to me one of the worst forms of vandalism, not least for the vulnerability which it leaves behind. I suppose that, if I tried hard, I could just about make a case for understanding bored teenagers carving their initials into doors, or militant aetheists throwing stones through windows, or even the violent schizophrenic who put out all of the stained glass windows in one of Suffolk's churches about twenty years ago. But the theft of slabs, and lead, and copper and the like, these irrevocable attacks on our priceless heritage by thugs who want nothing more than a few fivers in their back pockets, should be a cause for great shame. I was only grateful that the kind people of Crostwick still allowed the key to the inner door to be given out. You step into a church which is all of its 19th Century restoration, but with an endearing rustic feel which tells us more about Crostwick than it does about the Victorians. There is one significant medieval survival, a St Cristopher wall painting on the south side of the nave facing the north doorway. It is rather indistinct, despite being recently restored, and perhaps isn't as good as some of those in the churches to south-east of Norwich, but it is always good to see such a survival. The font is a good one, with seated Saints in each panel and standing ones in the shaft, much in the style of some of the15th century fonts to the south-east of here in the Yare Valley. My favourite feature, which I have not come across elsewhere, is the figure of St John, seated with his poisoned chalice. But the serpent here is a long snake rather than a serpent, and unwinds itself into his lap. The roof above is pleasingly rural in character - is it 17th Century, or a Victorian copy? Under the tower, an angel who had once sat at the top now gazes sadly out from behind a lawn mower. The screen is a good reproduction of the early style of some Norfolk screens, featuring the double wheel above the entrance. You can see medieval versions of the same thing at several churches, including Merton. Up in the chancel, the 19th Century glass is very good. That on the south side bears the signature of William Wailes and the date 1853, while the adjacent panel has the signature of the restorers, the King workshop, and the date 1989. Up on the wall nearby is remembered Eliza Willett, relict of Joshua Kirby Trimmer, eldest son of the authoress. This is a roundabout way of saying that Eliza was the daughter-in-law of Sarah Trimmer. Mrs Trimmer is not well-known today, but her influence lives on: of not many people can it be said that they created a genre. Born in Ipswich, she was an 18th Century writer and a collector of children's literature. She published a periodical, The Guardian of Education, which was the first to review children's literature in a serious way. She defined the parameters of what children's literature might include, and compiled the first history of the subject, thus establishing the canon, and recording its early landmarks. Sarah Trimmer's work has been built on considerably since, but it formed the basis for what we still understand children's literature to be today.